I love this list of play ideas put out by Sarah Marchant from Goedeker’s Home Life to keep your kids playing all year round! Outdoor Activities for the Entire Year. 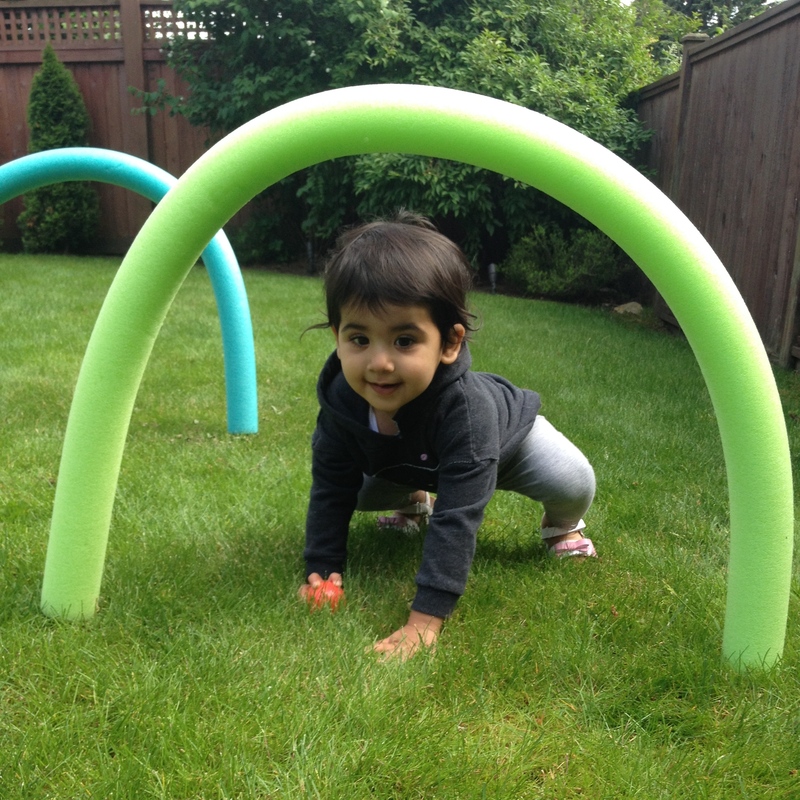 For outdoor play time, I set up an obstacle course using pool noodles stuck into the ground with bamboo BBQ skewers. I was so lucky to have so much help today!!! I had a bunch of errands to run and so after R’s nap, my sister was with R during outdoor play time. My sister encouraged R to kick the ball through the pool noodles and also crawl through them. 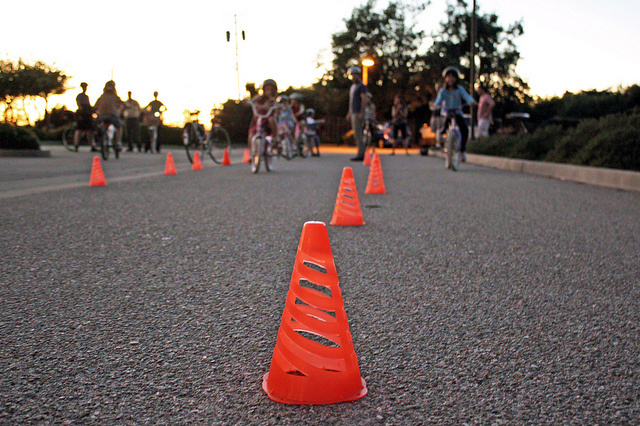 This activity is so simple and is great for kids of many ages. 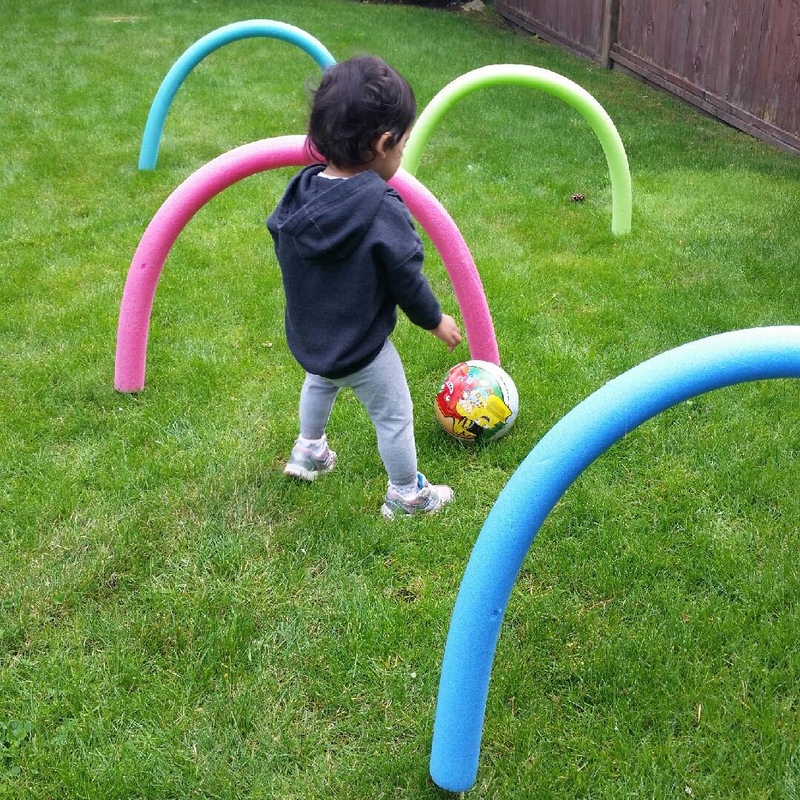 It can be used with younger children to encourage them to crawl and can be used with older children to practice ball skills. The ball can be thrown through the hoops or kicked through. Play with multiple kids and set up two pool noodle nets on either side of the yard and make your very own soccer game! Set up two rows of pool noodles to run through and have races with two groups of kids. 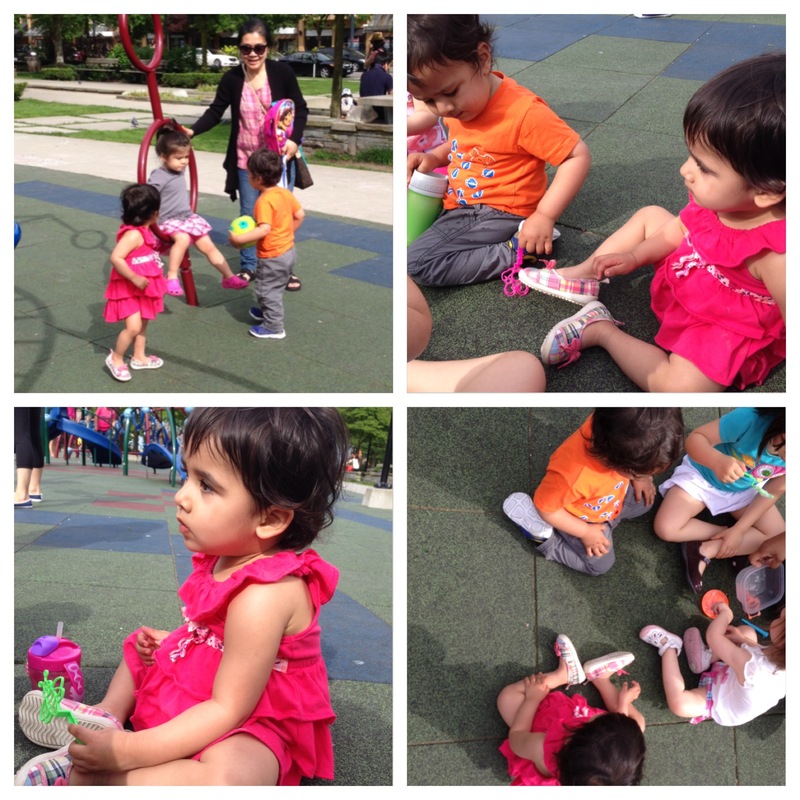 We went to downtown Vancouver to play at the park with K and his dad. I love this playground since it has a soft and bouncy play surface and there are tons of other families out. Most of the parks in our area have wood chips as ground cover, and R spends the majority of the time just collecting the wood chips. Here, the kids made new friends, played with bubbles, climbed, ran, chased birds, slid down slides, got on swings, petted dogs and laughed plenty! An older girl at the park took a liking to R and grabbed hold of her hand while showing her around. The two girls crouched under a tire swing and giggled together. Where as before, R would be hesitant to leave my side, I now see her dancing about and engaging with other kids. I couldn’t be happier! I forgot to pick up marshmallows for one of our activities for the day (oops! ), so I got in a nice long walk with R in the stroller before she had a play at the park. In our area, a walk to the market results in a hike back to our park and house since we live on a mountain side. It’s a perfect excuse to get in some great exercise! I don’t always have time to get in a good work out every day, so I’m always looking for opportunities to fit one in! 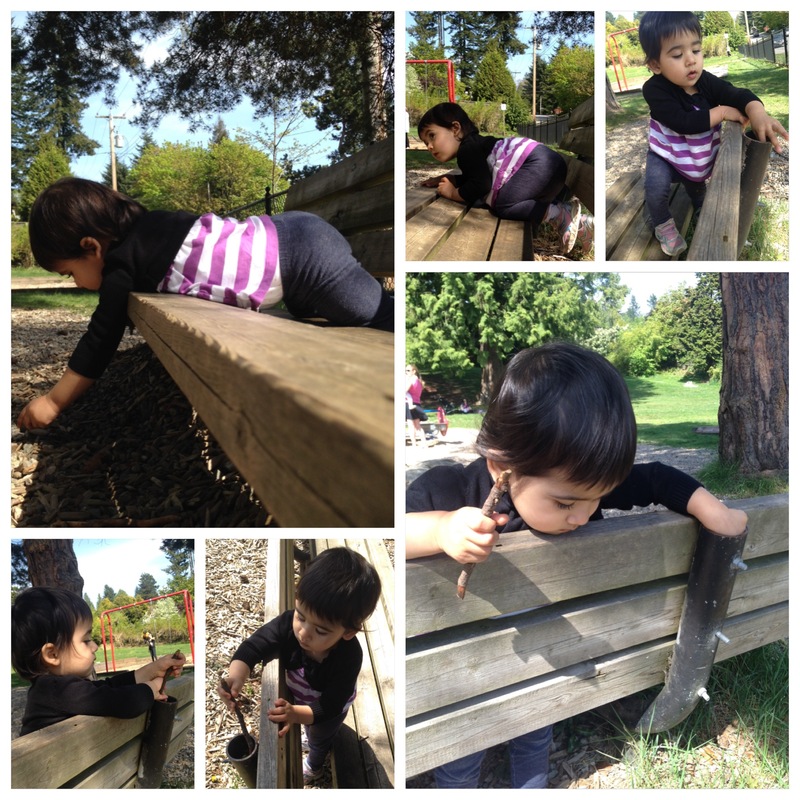 Besides all the usual stuff R does at the park, she was particularly interested in a wooden bench. It entertained her for 30 mins! She explored all the nooks and crannies in that bench. Sometimes she was exploring right-side-up, other times, she was hanging up-side-down. Offer positional vocabulary to the child. While R was playing on the bench, I described her location on the bench with words such as up, down, on and under. She now understands the concept of up and asks for help getting “up” onto things. 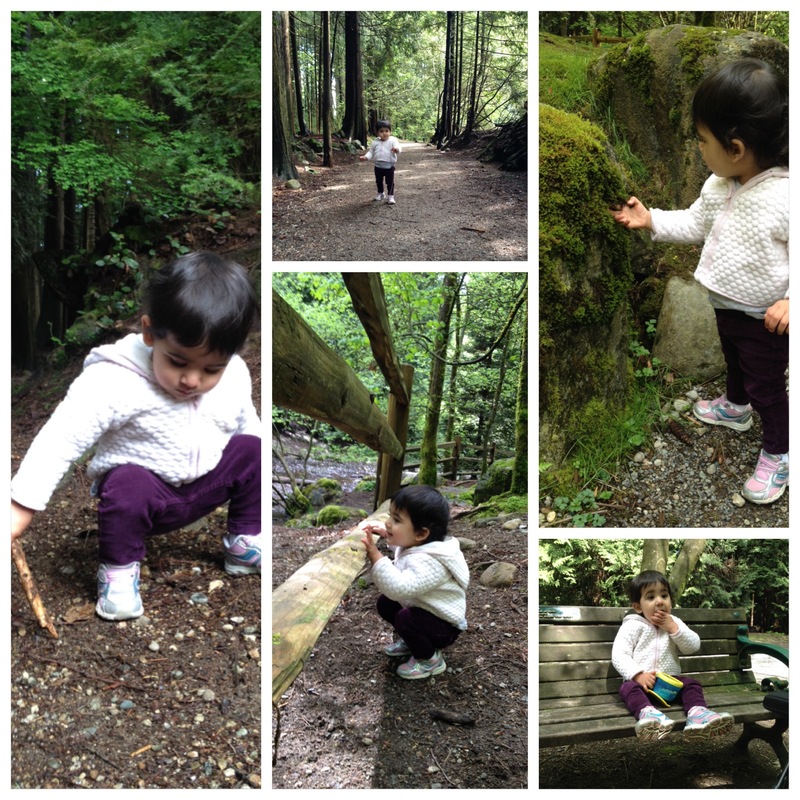 We explored the forest at Princess Park in North Vancouver and also paused for a snack there. There are tons of great things to pick at, touch and uncover. 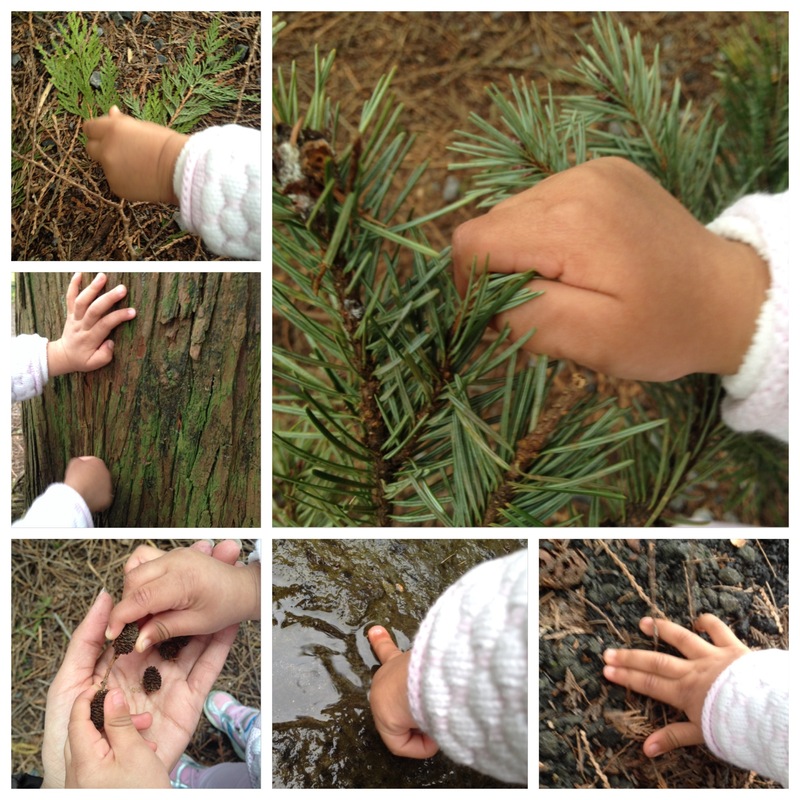 This park is a wonderful setting for learning about nature and all its beautiful elements. Amongst the highlights are plenty of hiking trails, a playground for kids, a bridge that crosses a rocky stream, gigantic looming trees and huge moss covered rocks. If you have a dog, it’s a great open space to let the dog off the leash. When ever we are here, we meet some wonderful dog owners who let R pet their dogs and give them treats. I’m so proud of how fearless she is! Many times, she has put a treat right into a dog’s mouth! Provide vocabulary for objects your child is interested in. R loves to collect rocks and sticks, so I name these objects for her and encourage her to use the vocabulary herself. Through rich shared experiences in nature, R can now identify rocks and sticks and use both terms. 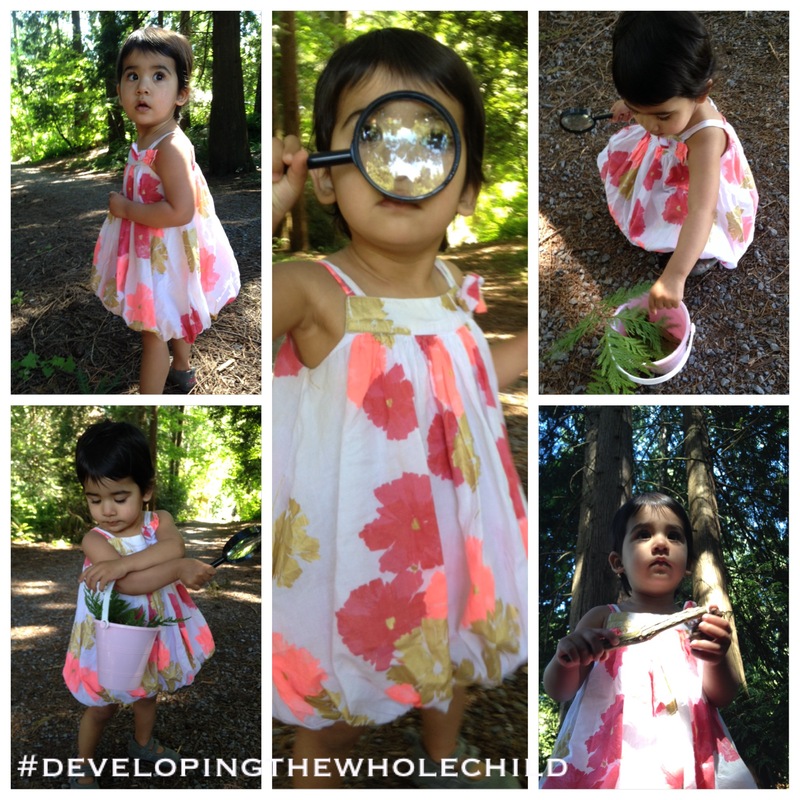 We used R’s outdoor play time to do a nature walk to enhance the planned activity for the day. It worked out perfectly since the rain had finally let up at this point. There were tons of textures to explore in the woods and by the creek near the green belt. R grabbed, pulled apart, scraped, scratched, poked and rubbed anything she could find. I extended her learning by providing words for the different textures such as rough, smooth, spiky and soft. Although I have no expectation for R to use the words, I still do provide the textural words to expand R’s listening vocabulary.